Finale PrintMusic is the fast, easy way to bring your music to life with professional results. From the makers of Finale®, the world’s leading music notation software, PrintMusic is perfect for songwriters, students, teachers, church musicians, and band leaders. Get started right away. TheSetup Wizard configures key and time signatures, transpositions, pickup measures, and more - instantly. Want an engraved or handwritten look? Select adocument style to personalize the appearance of your music. Play your MIDI keyboard with a metronome and watch your music appear on screen in real time. Play a brass or woodwind instrument into a microphone using our exclusive MicNotator®. Click notes into place with a mouse – and hear them as you do. Enter notes in step-time from your computer or MIDI keyboard. Scan your music with SmartScore® Lite (included) and import MIDI andMusicXML files. Free Software Synthesizer with 128 instrument sounds and marching percussion sounds fromRow-Loff™. Human Playback™ to give your music nuance, as if performed by live musicians. Band-in-a-Box® Auto-Harmonizing adds harmonies to your melodies. Save your music as anaudio file to burn CDs or save on an iPod. Powerful mixer fine-tunes your playback. Print your score or parts: Finale® technology ensures world-class output. Add dynamics, tempos, chord symbols, guitar fretboards and tablature, articulations, andmore. QuickStart Videos show you how – on your computer screen. No matter your musical emphasis (classical, jazz, rock, etc.) 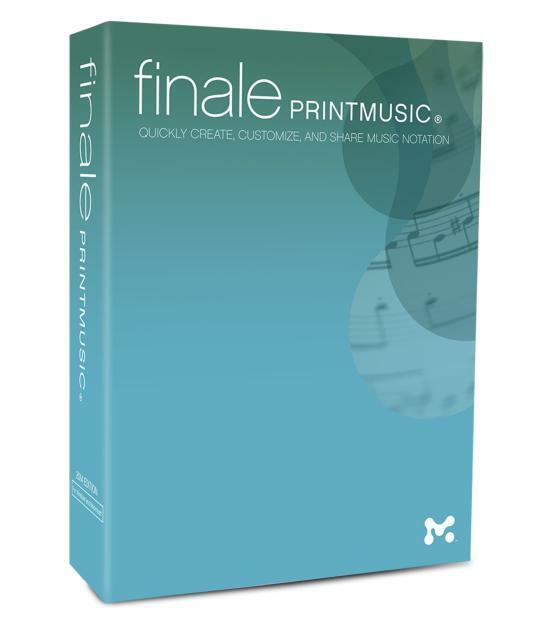 Finale PrintMusic music composition software provides high-quality results without the expense of our more comprehensive product Finale. PrintMusic music-making software is geared towards educators, musicians, composers, and others who don't need the advanced engraving capabilities of Finale. At such a low cost, no other music composition software provides the number of features and intuitive interface that PrintMusic does, making this the ideal software for most casual composers. When you don't want to pay for features you don't need, but still want professional quality software, PrintMusic is the product for you.